Don’t miss this spectacular production which sees the plucky title character set off on a daring mission across the seas with an eclectic band of companions. Filled with music and laughter throughout, there is no better antidote to the pressures that the season can often bring than two hours of pure unadulterated escapism! Join the Worcester Repertory Company for the Swan Theatre’s latest spectacular, action-packed pantomime! The evil Sheriff of Nottingham is short of money. She has three plans: tax the peasants, fix the result of an archery competition, and marry her rich nephew to the soon-to-be-wealthy Maid Marian. Can Robin Hood save the day? Well, apparently not. Can Dame Ginny step in and help? Not looking likely… But what about the feisty Maid Marian? Starring Strictly sensation, comedian, King of pantomime and musical theatre star Brian Conley this family-friendly show is packed with spectacular special effects and laugh-out-loud comedy.. Fashion guru Gok Wan will be offering helpful style tips to The Ugly Sisters and creating the most magical ball gown in panto-land for Cinderella in his role as The Fairy Gokmother. The clock is ticking… book your tickets today! One of the UK’s best-loved actors, PAUL NICHOLAS (EastEnders, The Real Marigold Hotel, Just Good Friends) takes centre stage as Captain Hook in this a swash-buckling and unmissable Christmas treat that’s got everything including flying, CGI special effects and all the traditional ingredients that make Bath pantomimes so special. 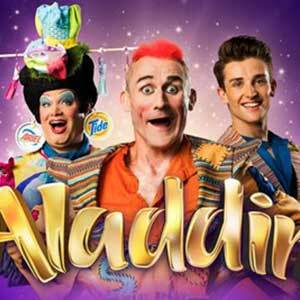 Polish your lamp and book a magic carpet ride to the pantomime where wishes do come true! You’re in for an all new, bigger-and-better production written and directed by legendary Blue Peter presenter and actor Peter Duncan. Sure to be a sell-out success, this much-loved panto delivers a brilliant star cast, including ITV`s hilarious Britain’s Got Talent finalist Drew Cameron as Muddles, a villainous Wicked Queen, a handsome Prince and the beautiful Snow White, plus the funniest and cutest Seven Dwarves, and a very clever Magic Mirror.